IT’S a huge a challenge to take an epic book, which has already spawned a stunning film, and condense it for the stage. Capturing the atmospheric backdrop of an Afghan childhood, the swirling emotions of racial bigotry and monstrous betrayal, followed by hectic alienation in America and the epic passing of generations – all on a spartan stage – is virtually impossible. Somehow, Giles Croft’s production does it. Khaled Hosseini’s original story is brought to life through the narration of Amir, played by Raj Ghatak, the privileged son of a rich but widowed Afghan businessman. He playfully tells of his early years learning to walk, talk and fly kites alongside his boyhood friend Hassan. The two youngsters are inseparable but it’s an unequal relationship as the ethnic Hazara boy is actually the servant of the spoilt Pashtun, Amir. The fanatically loyal Hassan is eventually betrayed in the most horrible way by the narrator before he flees Afghanistan for the US with his father at the time of the Russian invasion. The play faithfully follows the book as the central character marries Soraya, the daughter of an Afghan general, before being given the chance to “make things right” by returning to his home country, by now in the brutal grip of the Taliban. This interpretation of Amir seems a weaker, more flawed character than his literary counterpart and the real star of the show is Jo Ben Ayed’s Hassan. The pathos portrayed by his many cringing glances, timid pleading and baleful stares is utterly gripping. Ayed has few words but doesn’t need them, as he proves that acting is about so much more than diction. The leading pair are given sterling back-up by a cast mercifully bereft of star names – Gary Pillai is a commanding presence as Amir’s father Baba, Soroosh Lavasani’s brutal bully Assef is a truly nasty piece of work, while Karl Seth manages to bring some light relief to this harrowing tale in three different roles. The tale is told on a bare stage transformed with the aid of minimal backdrops and a few projections. 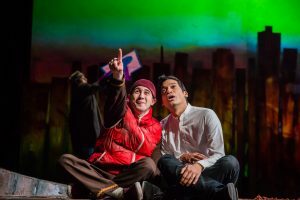 The kite flying is given impetus by the cast’s use of handheld wind machines and the overall atmosphere is pure Kabul thanks to the live tabla playing of Hanif Khan, which creates drama as well as adding an aural flavour of Central Asia. The themes of personal betrayal, growing up and family tribulations are all successfully weaved together and this production goes farther with simmering, topical undertones of racism, the desperate plight of refugees and the huge difficulties they face even when they reach a safe haven. The irony of a mainly white, middle-class audience cheering an immigrant for successfully outwitting red tape to bring a Muslim child to the West may be lost on some but gave me a cynical chuckle. In short, if you liked the book, you’ll love this.